چراغیان, حدیث, حیدری, ناصر, قدمی, سید امیر, زارعی, بنت الهدی. (1396). اثربخشی درمان مبتنی بر پذیرش و تعهد بر افسردگی حین بارداری زنان. 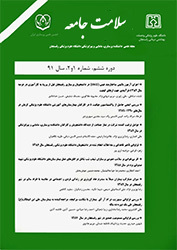 سلامت جامعه, 9(2), 56-64. حدیث چراغیان; ناصر حیدری; سید امیر قدمی; بنت الهدی زارعی. "اثربخشی درمان مبتنی بر پذیرش و تعهد بر افسردگی حین بارداری زنان". سلامت جامعه, 9, 2, 1396, 56-64. چراغیان, حدیث, حیدری, ناصر, قدمی, سید امیر, زارعی, بنت الهدی. (1396). 'اثربخشی درمان مبتنی بر پذیرش و تعهد بر افسردگی حین بارداری زنان', سلامت جامعه, 9(2), pp. 56-64. چراغیان, حدیث, حیدری, ناصر, قدمی, سید امیر, زارعی, بنت الهدی. اثربخشی درمان مبتنی بر پذیرش و تعهد بر افسردگی حین بارداری زنان. سلامت جامعه, 1396; 9(2): 56-64. مقدمه: افسردگی حین بارداری در مراقبت از نوزاد، ارتباط مادر و فرزند، مراقبت از سایر فرزندان و ارتباط با همسر تأثیر دارد. پژوهش حاضر با هدف تعیین اثربخشی درمان مبتنی بر پذیرش و تعهد بر افسردگی حین بارداری انجام شد. مواد و روش­ ها: روش پژوهش حاضر نیمه­تجربی و به صورت پیش­آزمون، پس­آزمون همراه با گروه کنترل بود. جامعه آماری این پژوهش شامل زنان باردار مراجعه­ کننده به مرکز بهداشتی- درمانی ولی­عصر شهرستان دلفان در 6 ماهه اول سال 93 و نمونه این پژوهش،30 نفر بودند که نمره آنان در آزمون افسردگی بک بالاتر از میانگین (40) بوده و به صورت تصادفی در دو گروه 15 نفری قرار گرفتند. مداخلات درمانی (رویکرد پذیرش و تعهد) روی گروه آزمایش طی 8 جلسه و هر هفته یک بار انجام پذیرفت. گروه کنترل هیچ آموزشی دریافت نکردند. جهت آزمودن فرضیه­ها از آزمون کوواریانس در سطح یک درصد استفاده گردید. نتیجه ­گیری: باتوجه به نتایج مطالعه حاضر توصیه می­شود درمان مبتنی بر پذیرش و تعهد توسط متخصصان برای درمان افسردگی حین بارداری استفاده شود. Introduction: Considering the fact that depression during pregnancy has an effect on taking care of the baby as well as the relationship between mother and the child, taking care of other children and the relationship with the spouse, the present study was conducted with the aim of determining the efficacy of the acceptance and commitment therapy on depression during pregnancy. Materials and methods: The design of this study was quasi-empirical, pretest-posttest with control group. The population included the pregnant women referring to the health care center of Vali-e-Asr in the city of Delfan in the first six months of the year 93, and the sample included 30 women whose score in the Beck depression questionnaire were higher than the mean (40) who were assigned to two groups of 15 randomly. Then, the treatment intervention (the acceptance and commitment therapy) was conducted on the experimental group for 8 sessions, one session in a week. The control group received no treatment. To test the hypothesis the covariance method with the significance level of 0.01 was used. Results: The results indicated that the independent variable affects the reduction of depression during pregnancy in women with 60% degree. In other words, the acceptance and commitment therapy resulted in a decrease in the depression of pregnant women (F= 59.50 p>0/01). Conclusion: Since the acceptance and commitment therapy affects the reduction of depression of the women during pregnancy, it is recommended that this treatment be used by the specialists to treat depression during pregnancy. Lowdermilk F & Perry S. Maternity&women health care. 8thed. Washington: mosby ; 2004: 33-4. Stewart DE. Depression during pregnancy. New England Journal of Medicine 2011;365(17):1605-11. Evans J, Heron J, Francomb H, Oke S, Golding J. Cohort study of depressed mood during pregnancy and after childbirth. Bmj 2001;323(7307):257-60. Zettle RD, Rains JC, Hayes SC. Processes of change in acceptance and commitment therapy and cognitive therapy for depression: A mediation reanalysis of Zettle and Rains. Behavior Modification2011;35(3):265-83. Forman EM, Herbert JD, Moitra E, Yeomans PD, Geller PA. A randomized controlled effectiveness trial of acceptance and commitment therapy and cognitive therapy for anxiety and depression. Behavior modification 2007;31(6):772-99. Zettle RD. ACT for depression: A clinician's guide to using acceptance & commitment therapy in treating depression. 1thed. Oakland CA: New Harbinger Publications; 2007: 215-30. Bach P, Hayes SC. The use of acceptance and commitment therapy to prevent the rehospitalization of psychotic patients: a randomized controlled trial. Journal of consulting and clinical psychology 2002;70(5):1129-39. Hernández-López M, Luciano MC, Bricker JB, Roales-Nieto JG, Montesinos F. Acceptance and commitment therapy for smoking cessation: a preliminary study of its effectiveness in comparison with cognitive behavioral therapy. Psychology of Addictive Behaviors 2009;23(4):723-30. Gifford EV, Kohlenberg BS, Hayes SC, Antonuccio DO, Piasecki MM, Rasmussen-Hall ML, etal. Acceptance-based treatment for smoking cessation. Behavior therapy 2004;35(4):689-705. Twohig MP, Hayes SC, Masuda A. Increasing willingness to experience obsessions: Acceptance and commitment therapy as a treatment for obsessive-compulsive disorder. Behavior Therapy 2006;37(1):3-13. Hesser H, Gustafsson T, Lundén C, Henrikson O, Fattahi K, Johnsson E, et al. A randomized controlled trial of internet-delivered cognitive behavior therapy and acceptance and commitment therapy in the treatment of tinnitus. Journal of Consulting and Clinical Psychology 2012;80(4):649-61. Bond FW, Bunce D. The role of acceptance and job control in mental health, job satisfaction, and work performance. Journal of applied psychology 2003;88(6):1057-67. Groth-Marnat G. Handbook of psychological assessment. Translator pashasharifi hasan & Nikkhou mohamadreza. 2thed. Tehran: sokhan; 2007: 1010-20. Bohlmeijer ET, Fledderus M, Rokx T, Pieterse ME. Efficacy of an early intervention based on acceptance and commitment therapy for adults with depressive symptomatology: Evaluation in a randomized controlled trial. Behaviour research and therapy 2011;49(1):62-7. Folke F, Parling T, Melin L. Acceptance and commitment therapy for depression: A preliminary randomized clinical trial for unemployed on long-term sick leave. Cognitive and Behavioral Practice 2012;19(4):583-94. Ashja M, Farahbakhsh K, Sadrpushan N, Sotoudeh Z. Evaluation of the Effectiveness of Acceptance and Commitment Therapy on Reducing Depression of Housewives in Tehran. Cultural Educational Women and Family 2013؛ 7(19): 167-80. [Persian] <http:// journals. ihu. ac.ir/index. php/cwfs/article/view/2722%3E. Lappalainen R, Lehtonen T, Skarp E, Taubert E, Ojanen M, Hayes S. Preliminary controlled effectiveness trial: the impact of CBT and ACT models using psychology trainee. Behavior Modification 2007;31:488-511. Cuijpers P, van Straten A, Smit F, Mihalopoulos C, Beekman A. Preventing the onset of depressive disorders: a meta-analytic review of psychological interventions. American Journal of Psychiatry 2008;165(10):1272-80. Kanter JW, Baruch DE, Gaynor ST. Acceptance and commitment therapy and behavioral activation for the treatment of depression: Description and comparison. The Behavior Analyst 2006;29(2):161-85.